Amma stated recently: "The main reason for some of the conflicts in today's world is the separation between science and religion. In reality, religion and science should go hand in hand. Both science without religion and religion without science are incomplete." "But unfortunately, society is trying to segregate mankind into religious people and scientific people. Scientists say religion and spirituality are based on blind faith. Conversely, they argue that science is fact and has been proved through experimentation. The question is: Which side are you on: faith or proven fact? "In reality, the foundation of true religion is not blind faith; it is 'sraddha'. Sraddha is enquiry; it is an intense exploration within one's own self." "What is the nature of the experienced world? How does it function in perfect harmony? From where did it come? Where is it going? Where will it lead? Who am I? Such was their enquiry. Who asks these kinds of questions - people of faith or people of science? Both do." She's really on to something - duh - it's AMMA after all! 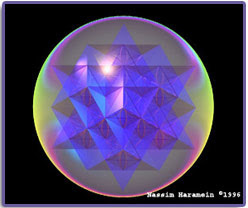 Anyway the work of Nassim Harimein at the Resonance Project demonstrates the absolute connection with spiritual principles, sacred geometry and physics. A unification of all sciences and philosophies emerging from a complete and applied view of the fundamental wheel-works of nature, its ensuing forces, and consciousness. * To share the knowledge and implications of The Unification Theory through publication of scientific papers and layman articles including books, videos and DVDs. * To create a headquarters center where the foundation principles of The Unification Theory are explored for the advancement of humankind. * To further explore - by means of archaeological and anthropological studies - the history of ancient civilizations, their philosophies, and their understanding of Unification. We are guided by our sense of the interconnectivity of all things and of the spirit of Unification leading us through our individual endeavors to reach our ultimate potential, benefiting both self and humanity as a whole. We are driven by our appreciation, respect and affirmation for all life."